Building a new website is a daunting prospect. If you've ever had to build one for your business, you'll understand the stress of ensuring it's delivered on time, on budget and addresses the problems which drove you to create it in the first place. There’s a lot of work to be done, components to be managed and costs to be accounted for. Also, as you make the switch over from your old website to your new one, you might also see a drop in organic traffic (which is most likely your best source for quality leads). And as if the above wasn't enough, you also have to decide on whether to keep your website in its current content management system (CMS) or move it to a new one. Changing CMS can be a difficult decision to make. Every CMS has its pros and cons, from better tools and features to ease of use and pricing. 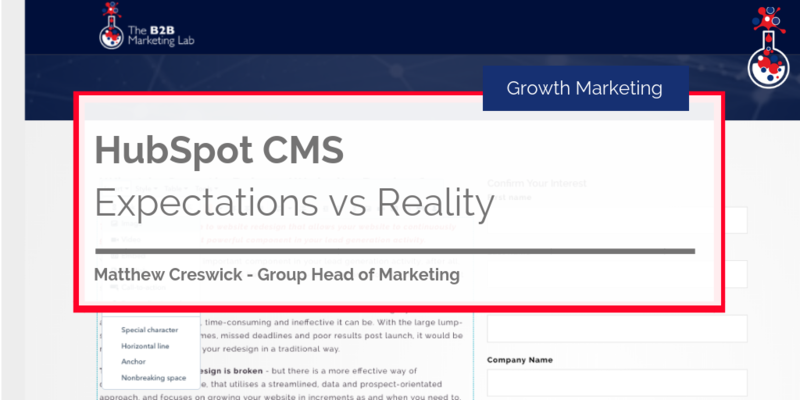 In this blog, we're going to talk specifically about the HubSpot CMS – as we use it and it's head and shoulders above the competition – as well as what anyone contemplating building their site with it can expect. Expectation – Creating templates in HubSpot will require website development and coding knowledge to create the templates from scratch. Reality – If you want to build your templates from scratch, you will definitely need a developer. That said, if you have the knowledge and expertise to do it yourself, HubSpot has all the tools you need. No matter what you choose to do, whether you enlist a HubSpot partner, an outsourced developer or purchase a template pack – once you have the templates built, cloning, editing and creating new ones is pretty simple and straightforward (this is our recommended method). Expectation – Probably a little glitchy and not as intuitive as it sounds. 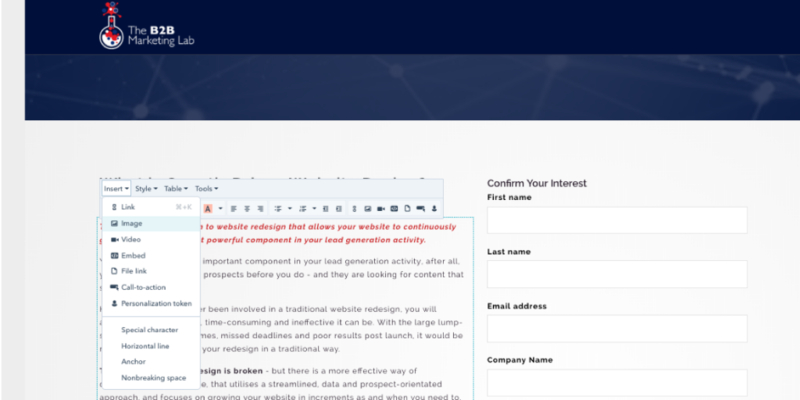 Reality – The HubSpot on-page editor is incredibly easy to use. It is literally like viewing a live version of your webpage - but with the ability to edit every module on the page. You can edit text, add images and calls-to-action (CTAs), edit the source code, insert video... the list goes on. You can ‘save’ your changes, but these changes are not put live on your website until you hit publish. Being able to edit your web pages in such a fashion allows you to see what it will actually look like when it goes live. No more clicking refresh or clearing your browser cache to see web page changes. Expectation – It's up to you to ensure that your web pages and articles are optimised for search. Reality – It’s still up to you to ensure everything is optimised correctly, but HubSpot helps hugely. Firstly, the system is really great at helping you ensure your site and articles are fully optimised. Built into the on-page editor is an optimisation tab. On the optimisation tab is a traffic light system which shows you which elements of the page are optimised for search - i.e. if you have included a keyword in the header, copy and meta description, to name a few. This is what HubSpot call their 'as-you-type-advice'. Secondly, HubSpot has a content strategy tool which is now part of its SEO tools. The content strategy tool helps you with creating pillar pages, topic clusters, linking your content and meeting the requirements of Google to rank for your best-performing keywords. The content strategy tool can also be integrated with Google Search Console to improve the information HubSpot receives. Expectation – Not as in-depth as Google Analytics. Reality – All of the reports in HubSpot are very easy to find, read and export. There are a number of different reports you can compile in HubSpot. That said, you’ll probably want to dig into your Google Analytics (GA) account to get some really in-depth reports and information on your website's performance. What HubSpot excels at is providing top-level information – traffic, conversions, time on page, leads generated, submissions and so on. If you want to look at things like visitor journeys, then you’ll still want to look in GA for that. HubSpot can be integrated with GA – and a number of sophisticated reporting tools, like Databox – allowing you to create detailed dashboard reports. Expectation – This will be time consuming and complicated to set up. Reality – It’s very easy. You can literally click on an item on a web page and tell HubSpot: "if the viewer is a person on ‘this’ list, show them ‘this’ instead". For example, if you have a CTA on your homepage and want to promote a different piece of content or show a different CTA to specific website visitors - say those who have visited your website 10 times - you can do so using smart content. You could also use smart content to show different content to specific contacts based on where they are in the sales cycle, ensuring leads see different content to customers, for instance. Expectation – A costly process of connecting data points including some custom integration. Reality – HubSpot has over 200 integrations available to HubSpot users. Different tools require different set up requirements based on how much data is moving between the two tools, but at the same time HubSpot has made it very easy to integrate tools. For example, if you are connecting Eventbrite or GoToWebinar, these integrations can be done within a few minutes. The integration platform is actually one of the key benefits of using the HubSpot CMS, especially if you are already using a number of different other tools within your marketing activity. 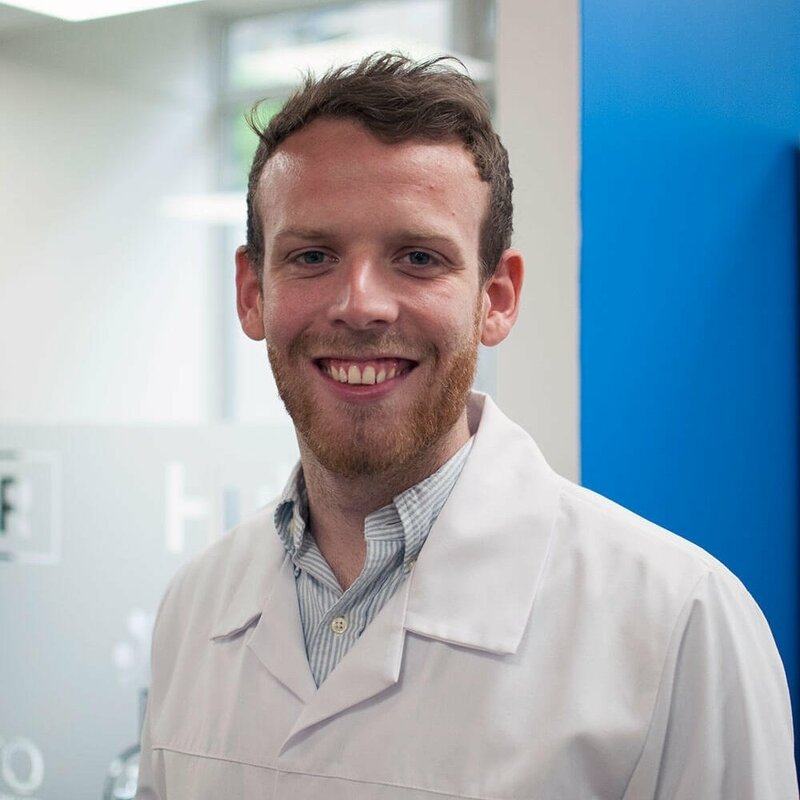 Expectation – HubSpot should have all the tools I need to convert leads on my website. Reality – Yes, it does. HubSpot’s conversion tools are perfect for improving conversion rates on your web pages. If your conversion rate is under 5%, then there are definitely things that could be improved. Not only does HubSpot include traditional conversion tools (CTAs, forms and landing pages), it also includes modern tools, such as live chat and chatbots, giving website visitors other ways to engage with your business. Reality – Expensive, but worth it. HubSpot’s CMS sits in the middle of the CMS market, which means it’s more expensive than WordPress, but much cheaper than any large/enterprise tool like Adobe Experience Manager. However, compared to WordPress and Adobe, HubSpot has all the tools and features that are included within any CMS system, and at a fraction of the price of many enterprise solutions. Expectation - Should help my sales and marketing teams to improve their work. Reality – Exactly, by having your marketing, sales and service data in one platform – you give your teams all the context they need to engage with leads and help your business grow. Your marketing team can use the data from sales to improve their activities: for example, using information stored in a contact's record following a discovery call to create targeted content. Your sales team, on the other hand, know everything a specific contact has done on your website, putting them in an excellent position to engage before a call. HubSpot is a fantastic CMS system, and we have seen lots of companies worldwide use it to help drive business growth. If you would like to view some examples of websites built using the HubSpot CMS, check out our blog here. If you want to know more about what features are essential for a B2B website, click here. Got questions or looking for a demo on the HubSpot CMS? Simply book some time below and one of our team will help you at a time that suits you.